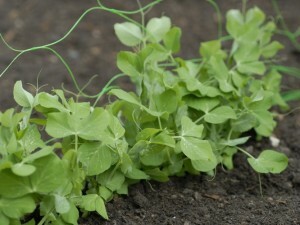 Growing peas is yet another great option for your garden. You do need to be a little careful about the time of year you sow, but in general, peas are very straightforward to plant and look after. 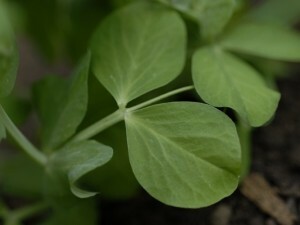 A good idea, in small gardens, is to sow peas in ground that can afterwards be used for salad, leeks, or cabbage. Also be aware that peas need plenty of water to thrive. 1. 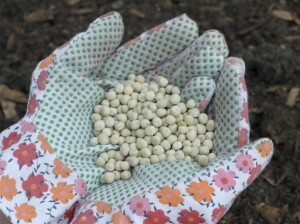 Peas need sun and well-drained soil. 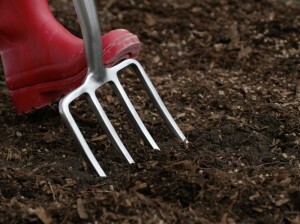 Dig in plenty of compost and well-rotted manure, with a top dressing of general fertiliser. 2. 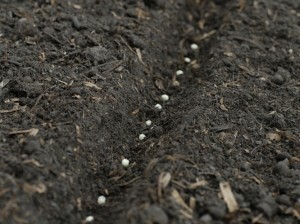 The hard round seeds are sown outside when the soil temperature is above 10°C, for a first harvesting in mid-summer. 3. Sow seed 5cm apart in single V-shaped rows, 5cm deep. The distance between rows should equal the height of the full-grown plant. 4. Yields are better and picking is much easier when pea plants are well supported. Use pea sticks made from brushwood or green plastic netting. 5. Peas need plenty of moisture, especially as pods begin to fill. Begin watering when flowers appear – around three litres per square metre per day. Of all the vegetables that you can grow in your garden, I would suggest that the difference in flavour between a shop bought pea and a home grown one, is the most dramatic (in a good way!). There are many varieties to choose from, so always pay close attention to any specific supplier instructions. This entry was posted on Wednesday, March 14th, 2012 at 6:13 pm	and is filed under Gardening Guides, Growing Vegetables. You can follow any responses to this entry through the RSS 2.0 feed. You can leave a response, or trackback from your own site.